While I had to miss the much-anticipated ceremonial opening of Princes of Surf at the Santa Cruz Museum of Art and History’s First Friday celebration earlier this month, I managed to visit the exhibition a few days ago. Princes of Surf tells the story of Hawaiian princes David Kawananakoa, Edward Keli’iahonui, and Jonah Kuhio Kalaniana’ole, detailing their visit to Santa Cruz in the summer of 1885. It serves as a prequel of sorts to the MAH’s 2010 exhibition Surf City Santa Cruz: A Wave of Inspiration, which is featured prominently in Going Coastal. Since Surf City Santa Cruz filled an entire floor of the museum, I admit I was surprised to see Princes of Surf in a small gallery. 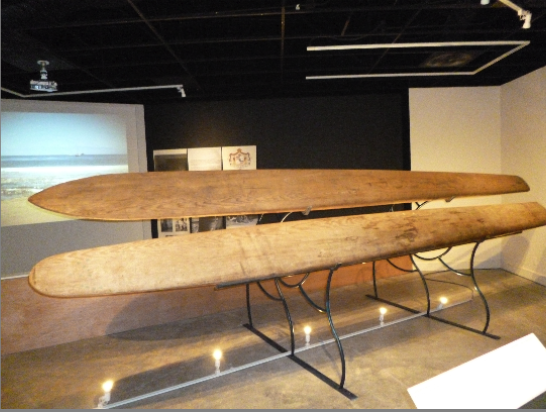 The intimate setting is a strategic move, since it ensures that visitors focus on two historic surfboards from the princes’ Santa Cruz summer. Next > Ladies and gentlemen, The Great Morgani!